Forum Index > Off-topic Talk > Anyone know a source for 18th century style sporrans? Posted: Fri 14 Apr, 2006 11:40 am Post subject: Anyone know a source for 18th century style sporrans? I am looking for a good 18th century style sporran. Although I would be interested in any that are historically appropriate, I am particularly interested in ones with have a brass cantle. Donnie Shearer has some on his website, but at $400-500, they are out of my price range. If I can find an appropriate cantle, I believe I can make the leather body of the sporran myself. Chris, I don't have the foggiest idea what they go for but the one's Rob does for Albion look pretty spiffy. 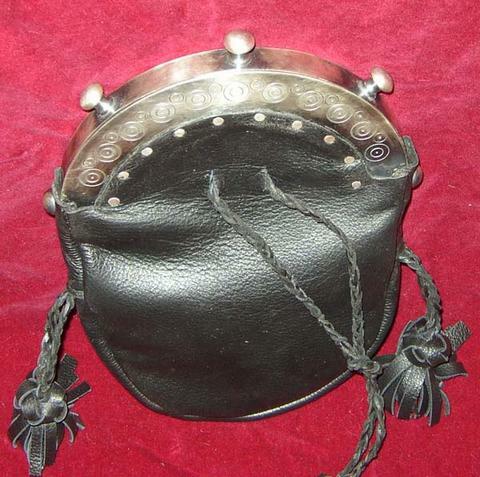 Patrick Thaden made a really nice period cantle for Alex McCracken, to which Alex added the leather pouch ! make the bag portion of the sporran. I didn't make a thing. Thanks for your replies. That sporran is a beauty, and just the style I am looking for. Alex -- can you tell me what the cost of the cantle was? Would you recommend the maker -- how was he to work with? together with the bag, are what jacked the price up. be more common as well, historically. twist , which is to say, I highly recommend him.